Historical fact: architectural terra cotta has been used as a building material for thousands of years. Experienced Bricks is pleased to annouce that we will now be offering reclaimed architectural pieces to enhance your landscaping projects. Visit our website at www.exbricks.com to view a sampling of the reclaimed architectural products we offer. 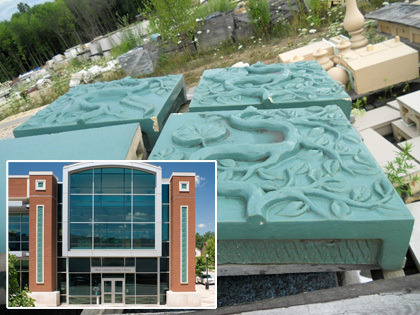 The beautiful terra cotta decorative panels, in the pictures above, were used on the outside walls of a library in West Lafayette, Indiana.